Pesantren is the traditional Islamic educational institutions which grown and developed in the middle of Islamic society in Indonesia and is also an educational institution who participates in educating and giving the big contribution for Islamic Education, also in the implementation of education in Indonesia. Pesantren education system is basically a traditional Islamic boarding education system, the place where the students live together and learn the religious sciences under the guidance of kyai. Pesantren as Islamic educational institution in Indonesia also has the big challenge as like such as modernity and radical Islam that continues to grow in Indonesia especially in the environment of Islamic education. Therefore, Pesantren as the oldest Islamic educational institution in Indonesia becomes a stronghold for Islam to strengthen the teachings of moderate Islam. The development of Pesantren nowadays also as an opportunity for Muslims to make moderate Islamic teachings, Islamic teachings that are not easily affected by the fake news/hoax and not easily ignited emotions. Moderate Islam that the Islamic people covet is friendly Islam and not easily angered is a teaching that will always be taught in Pesantren as an Islamic educational institution. AINI, Ajibah Quroti. Islam Moderat di Pesantren : Sistem Pendidikan, Tantangan dan Prospeknya. Edukasia Islamika: Jurnal Pendidikan Islam, [S.l. ], v. 3, n. 2, p. 206-221, apr. 2019. ISSN 2548-5822. 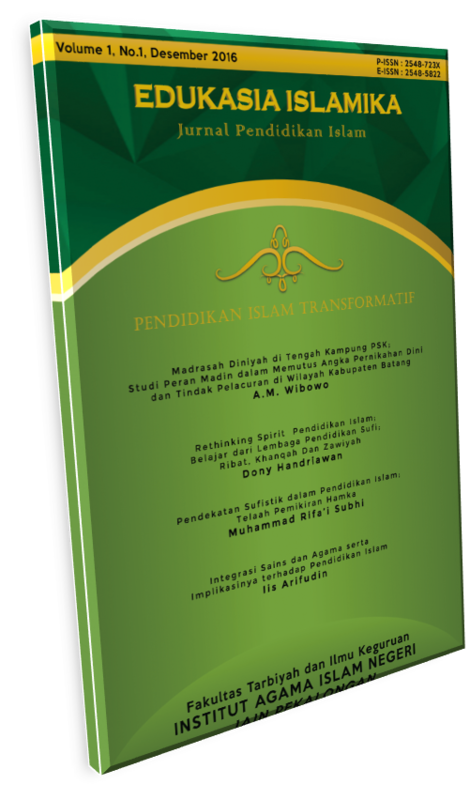 Available at: <http://e-journal.iainpekalongan.ac.id/index.php/edukasiaislamika/article/view/1600>. Date accessed: 21 apr. 2019. doi: https://doi.org/10.28918/jei.v3i2.1600.